Mike - Black Soap. Vinyl LP. Bleep. Mike is the young pretender currently making a big splash in the world of New York rap. Just 19 years of age, the young Brooklynite has already turned heads with several tapes of eloquent, erudite hip-hop. 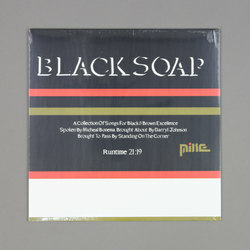 Black Soap precedes the impressive Renaissance Man full-length, and this seven-track EP shows the start of Mike’s hot streak. The beats here are lo-fi slopes that veer between pretty (‘Life Mask’) and abrasive (‘Of Home’). Atop these Mike, wise beyond his years, delivers sage-like bars in a rich baritone. The comparisons to MF DOOM and Earl Sweatshirt have come easily thus far, but there’s plenty of Guilty Simpson and even a little King Krule in here.